Cocktail hour at 5:30 p.m. The Comedy Night will include a cocktail hour and full dinner buffet catered by the Four Oaks Country Club. Stand-up comedian and former Middlesex District Attorney Paul D’Angelo will headline the show. The Foundation will honor Retired Boston Police Superintendent-in-Chief Robert Faherty, who recently stepped down as Chairman of the Board for Cops For Kids With Cancer. 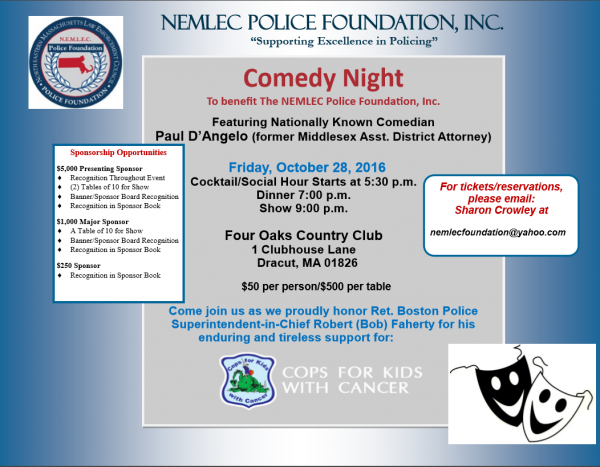 NEMLEC is currently accepting sponsors, donations and raffle items for the Comedy Night benefit. The event is open to the public. For tickets and more information, contact Sharon Crowley at nemlecfoundation@yahoo.com or 978-852-3589. Follow the Foundation on Twitter @NEMLECInc or Facebook.